Garmat USA has joined the Society of Collision Repair Specialists as a corporate member, the first paint booth manufacturer to partner with the group at that peak level. Teter said in a brief interview that the move was also encouraged by an interaction at a Collision Industry Conference week event. “One of my owners came up, and he hugged me and said, ‘You’re with Garmat, you need to be here,'” she said. “That was very powerful for me that he said that,” Teter said: The vendor wasn’t considered an outsider but another voice in the collision repair industry. Another vendor’s input helped too. 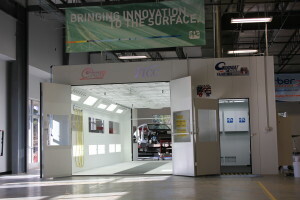 Founded in 1988, Garmat’s products include the Accele-Cure Accelerated Drying System for waterborne and solvent paints; booths large enough to accommodate trucks and RVs as well as custom-designed configurations; downdraft and modified downdraft fixed booths like the Tier 1 and Frontier, refinishing stations; closed-top, open-front booths; mixing rooms; preparation areas; and other jamming booths. Garmat also annually honors one the industry’s best paint technicians with its Sharp Shooter award.